Tara Sophia Mohr is a writer, coach and an expert on women's leadership and well-being. Her work helps women play bigger in their work and in their lives. With an MBA from Stanford University and an undergraduate degree in English literature from Yale, Tara takes a unique approach that blends inner work with practical skills training, and weaves together both intellectual rigor and intuitive wisdom. Tara has a deep commitment to amplifying women's voices. She is the creator of the global Playing Big leadership program for women and the co-creator of two anthologies of contemporary women's writings, The Women's Seder Sourcebook and The Women's Passover Companion. Her 10 Rules for Brilliant Women have struck a chord with tens of thousands of women around the world. In 2010, Tara was honored as a Girl Champion by the Girl Effect organization, which supports girls' education in the developing world. She is a regular contributor to The Huffington Post and has been featured on TODAY, BigThink.com, Whole Living, CNN.com, USA Today, International Business Times, Ode Magazine, Forbes, beliefnet, and numerous other media outlets. She is also a poet and the author of The Real Life: Poems for Wise Living. You can learn more about Tara and the Playing Big Program at taramohr.com and follow her on Twitter at @tarasophia. Kristen Zimmerman is one of the co-authors of the Movement Strategy Center report, Out of the Spiritual Closet: Organizers Transforming the Path of Social Justice, along with Neelam Pathikonda, Brenda Salgado, and Taj James. As a Senior Fellow at the Movement Strategy Center, she leads the development of the Center's movement building practice and methodology. Her primary focus is the integration of transformative practice with strategy, movement building and alliance building technologies, and the use of story and narrative for movement building. Currently, she serves on the design team and faculty of the NoVo Foundation's Move to End Violence — a 10-year movement building initiative to end gender-based violence. She lives in Oakland with her 8-year-old son, Jonah Ravi, and her partner Adrienn. You can learn more about the Movement Strategy Center, and download the report, at movementstrategy.org. This month's guest is Lisa Truong, the Co-Founder and Executive Director of Help a Mother Out. Help a Mother Out is a grassroots organization that raises diapers and awareness, and advocates for long term change in the social safety net. Lisa is a social entrepreneur with over 12 years experience in technology and nonprofit sectors. Her work has been featured in media outlets including Redbook, Ladies Home Journal, KQED's The California Report, The San Francisco Chronicle, and The San Jose Mercury News, as well as national blogs including The Nation and The Huffington Post. She is passionate about social innovation and technology used to change the world. You can learn more about Lisa and Help a Mother Out at helpamotherout.org and follow her on Twitter at @helpamotherout. President of Rockwood Leadership Institute, Akaya Windwood is internationally recognized for elevating the effectiveness of leadership and collaboration in the nonprofit and social benefit sectors. Her vision for our global community includes infusing a sense of purpose, delight and wonder into everything we do. She brings her skills as an organizational consultant and executive coach to her lifetime commitment to working for a fair and equitable society and to Rockwood's network of 4,000 powerful, collaborative, and interconnected leaders. Beth Terry is the author of Plastic-Free: How I Kicked the Plastic Habit and How You Can Too. She also writes the popular blog, My Plastic-Free Life, and is a founding member of the Plastic Pollution Coalition. Beth gives presentations on living plastic-free and why our personal changes do make a difference. She spearheaded the successful Take Back the Filter Brita recycling campaign in 2008, and her life and work have been profiled in Susan Freinkel's book, Plastic: A Toxic Love Story, Captain Charles Moore's book, Plastic Ocean, and the award-winning film, Bag It. When she's not out fighting plastic pollution, she spends her time with her husband, and two rascally kitties in Oakland, CA. Will Allen is an urban farmer who is transforming the cultivation, production, and delivery of healthy foods to underserved, urban populations. After a brief career in professional basketball, and a number of years in corporate marketing at Procter & Gamble, Will returned to his roots as a farmer, using his retirement package to purchase a plot of inner city land with greenhouses where he has built the country's pre-eminent urban farm. He is now the CEO of Growing Power (www.growingpower.org), an organization that develops community food systems. In 2008, Will was named a John D. and Katherine T. MacArthur Foundation Fellow, a "genius grant," only the second farmer ever to be so honored. He is also a member of the Clinton Global Initiative, and in February 2010, he was invited to the White House to join First Lady Michelle Obama in launching, "Let's Move!" - her signature leadership program to reverse the epidemic of childhood obesity in America. In May 2010, TIME magazine named Will to the TIME 100 World's Most Influential People. In 2011, Allen was named one of the 7 World's Most Influential Foodies by Michael Pollan and Forbes Magazine. He was named the 2012 NCAA Theodore Roosevelt Award recipient. He lives with his wife in Oak Creek, Wisconsin, and is the author of The Good Food Revolution: Growing Healthy Food, People, and Communities. Deanna Zandt is a media technologist and the author of Share This! How You Will Change the World with Social Networking. She is a consultant to progressive media and advocacy organizations. Her clients have included The Ford Foundation, The Daily Beast/Newsweek, and Jim Hightower's Hightower Lowdown. She is a Research Fellow at the Center for Social Media at American University. Deanna specializes in social media, is a leading expert in women and technology, and is a frequent guest on CNN International, BBC Radio, Fox News and more. She works with groups to create and implement effective web strategies toward organizational goals of civic engagement and empowerment, and uses her background in linguistics, advertising, telecommunications and finance to complement her technical expertise. You can learn more about her work at www.deannazandt.com and follow her on Twitter at @randomdeanna. Ben Mangan is the President, CEO, and Co-Founder of the nonprofit, EARN. Since 2001, EARN has helped tens of thousands of low-income people enter the financial mainstream, and move toward prosperity with savings accounts for the unbanked, and matched accounts for low wage workers to invest in education, first homes, and microenterprise. Ben has more than 15 years of experience in policy leadership, innovation and strategic management. Ben was the Midwest Practice Leader for Ernst & Young's Public Private Development Group in Chicago, and served as Director of Organizational Strategy for the international micro-payments company, beenz.com. He is a regular blogger for the Huffington Post and SFGate, and serves as a lecturer on the faculty of the Haas School of Business at UC Berkeley. He holds a Bachelor of Arts from Vassar College and a Master of Public Policy from Harvard University's Kennedy School. Sara Potler is the Founder and CEO of Dance 4 Peace. Dance 4 Peace is a conflict resolution, civic education program that promotes empathy, understanding, mediation skills, anger management, and emotional and civic engagement through dance in youth around the world. Dance 4 Peace began in Bogota, Colombia as part of Sara's Fulbright Scholarship project in 2007. In conjunction with Aulas en Paz (Peaceable Classrooms), a multi-component pedagogical project designed to promote social and civic competencies and conflict resolution among primary-school students, Dance 4 Peace was designed, implemented, and evaluted in public schools in the outskirts of Bogota. Today, the program works in Washington, D.C., New York City, Colombia, the Philippines, and Nepal. Carinne Brody is a doctoral candidate in public health at UC Berkeley. She is conducting an evaluation of a reproductive health voucher program in Uganda and Cambodia as part of her dissertation, and she co-instructs the International Maternal and Child Health Seminar, and the Maternal and Child Health Core course at UC Berkeley. Carinne did a joint Masters in Public Health and Economic Development at Columbia University. Before and during her studies, she conducted field research for governmental and non-governmental organizations, as well as foundations, on maternal and child health in Sri Lanka, Ghana, Haiti, Somalia, Uganda, Kenya and India. Naomi Natale is the founding artist behind One Million Bones. Both an installation artist and photographer, Naomi was the founder and director of The Cradle Project, a large scale installation calling attention and raising funds for the 48 million children orphaned in Sub-Saharan Africa. Over 550 cradles were created and donated by artists around the world. Naomi has served as an artist-in-residence at Columbia College Chicago in 2008, 2010 and 2011. She speaks internationally on the topics of art and activism as well as her installation works. She is currently both a TED Senior Fellow and Carl Wilkens Fellow, respectively. Samin Nosrat creates community around food with her varied endeavors as a cook, teacher, writer, and accidental activist. She's known for the Pop-Up General Store, Tartine Afterhours dinners, Home Ec Cooking Classes, and the nationwide Bakesale for Japan that raised $140,000. Her newest project is organizing Chez Panisse Foundation's Eating for Education, a grassroots effort to create national awareness about school kitchen/garden programs nationwide. At the heart of all of Samin's work is the fundamental belief in the power of food to create meaningful connection. Kathy LeMay is the author of The Generosity Plan: Sharing Your Time, Treasure and Talent to Shape the World. She's also the Founder and CEO of Raising Change. Raising Change helps organizations raise capital to advance social change agendas and helps individuals create Generosity Plans to help change the world. She has been a social change fundraiser for 15 years, raising more than $150 million dollars in the fields of women's human rights, hunger and poverty relief, and movement-building. Twenty-year-old Rachel Cohen is the Founder and Executive Director of Hand2Paw. Hand2Paw's mission is to connect homeless teens and shelter animals in a mutually beneficial way. Hand2Paw provides homeless teens with professional skills training and therapeutic experiences. It also ensures that thousands of homeless and abandoned animals get the socialization and training they deserve. Rachel has loved animals since her parents got her the Eyewitness Companion Guide to Dogs for her 8th birthday. This fateful Hanukkah present, they now realize, was wholly responsible for her career trajectory. She is also a Penn student and is a current Top 15 National Finalist for the Washington Campus Compact's Students in Service Awards as well as the winner of a DoSomething Grant. Eighteen year old Aneesha Raghunathan is the founder of Hope Line Fashions. Hope Line's mission is to empower women around the world through the sale of unique T-shirts made by women. Robert Wolfe is the co-founder of Crowdrise, an online fundraising website with the tagline, "If you don't give back, no one will like you." They're all about, "raising money for charity and having the most fun in the world while doing it." Robert co-founded Crowdrise with his brother, Jeffrey Wolfe. Before creating Crowdrise, they started and built Moosejaw, a successful multi-channel retailer that combined humor, crowdsourcing, social commerce and creative marketing. Crowdrise's two other co-founders are Shauna Robertson, who has produced comedies like Suberbad, Knocked Up, Forgetting Sarah Marshall, and Anchorman, and Edward Norton (pictured here with Robert), who you know from his roles in films like Fight Club, American History X, and 25th Hour, but who is also a committed social and environmental activist. He has personally raised over 100 million dollars for charitable causes over the last 20 years. Gabriela Masala is the Founder of the One Love Alliance. The One Love Alliance creates visionary arts community flash mob events that are both transformative and entertaining, and are fueled by the values of unity, playfulness, creativity and love. Gabriela is the creator of the Inner Wealth Deck, and is a choreographer, dancer, intuitive consultant, retreat leader, and mom. She's also the wife of Kenya Masala, whose song, "Mango Delight," I use for the intro and outro of this show. Secret Agent L (Laura Miller), and her affiliated agents perform anonymous acts of kindess missions across the globe, and share them on Laura's blog, www.secretagentl.com. Laura was anonymous for a year, until she held a reveal party and fundraiser in July of 2010. Since then, her project has been featured on CNN, Glamour.com, and The Huffington Post, and the city of Pittsburgh, where she lives, proclaimed September 14th, Secret Agent L Day. A big thanks to the Big Vision Podcast listener who suggested I interview her for the show! A transcript of the interview is available on my blog, Have Fun, Do Good. Jensine Larsen is the Founder and CEO of World Pulse. World Pulse is a global media and communcation network devoted to bringing women a global voice. They broadcast and unite women's voices from around the world into a powerful voice for change. They produce a print and web magazine as well as host an interactive community newswire, called PulseWire, where women can speak for themselves to the world, and connect to solve global problems. A transcript of the interview is available on Have Fun, Do Good. Jessica Prentice is co-owner of Three Stone Hearth, a Community Supported Kitchen in Berkeley, California that uses local, sustainable ingredients to prepare nutrient-dense, traditional foods on a community scale. She is a professional chef, passionate home cook, local foods activist, and author of Full Moon Feast: Food and the Hunger for Connection. She is also the co-creator of the Local Foods Wheel, and coined the word, locavore. Author, Anna Lappe, talks about her new book, Diet for a Hot Planet: The Climate Crisis at the End of Your Fork and What You Can Do About It. Anna is also the co-author of Hope's Edge: The Next Diet for a Small Planet, and Grub: Ideas for an Urban Organic Kitchen. You can read a transcript of this interview on my blog, Have Fun, Do Good. Melinda Kramer and Amira Diamond are the Co-Directors of Women's Earth Alliance. Women's Earth Alliance, or WEA, unites women on the frontlines of environmental justice causes by coordinating training, technology, and financial support for thriving communities and the Earth. When I sat down to talk with Amira and Melinda, they had just returned from the West African Women and Water Training in Ghana. They talked about their experience there, WEA's work, and the paths that brought them to working together. You'll also hear some singing from the participants of the training as well as the song, "Oshun," by Hamsa Lila. A transcript of this interview will be up in about a week on my blog, Have Fun Do Good. Listen and subscribe to the Big Vision Podcast with iTunes. You can read a transcript on my blog, Have Fun Do Good. Music by Kenya Masala and Mary Mulliken. Listen and subscribe to the Big Vision Podcast in the iTunes Music Store. Patricia Loya is the Executive Director of La Cocina, a San Francisco Incubator Kitchen for Women. The mission of La Cocina is to cultivate food entrepreneurs as they formalize and grow their businesses by providing affordable commercial kitchen space, industry-specific technical assistance and access to market opportunities. They focus primarily on women from culturally diverse and immigrant communities. Patricia earned her undergraduate degree from the University of California at Irvine and went on to earn a Masters of Education degree from Harvard University. In 2001, Patricia was a fellow with the Executive Program for Nonprofit Leaders through the Graduate School of Business at Stanford University. In 2003, she participated in the Hispanics in Philanthropy Leadership Institute at the Kellogg School of Management at Northwestern University. Upon receiving her undergraduate degree, Patricia joined La Raza Centro Legal in San Francisco. She later co-founded Ujima Unidos, a Saturday school for African American and Latino youth in Oakland, California. She then went on to become the Executive Director of Centro Legal de la Raza where she worked closely with immigrant and low-income communities, assisted day laborers in forming their own worker association, and launched the flagship project, The Youth Law Academy. She became the Executive Director of La Cocina in 2009. A transcript of this interview is available on my blog Have Fun Do Good. Kimberly Wilson is a teacher, writer, do-gooder, entrepreneur, and eco-fashion designer who is currently obsessed with Paris, potbelly pigs, and all things sparkly. She is the creative director and founder of Tranquil Space, which was named among the top 25 yoga studios in the world by Travel + Leisure. She is also the author of two books: Hip Tranquil Chick and Tranquilista: Mastering the Art of Enlightened Work and Mindful Play. Jose has worked in business and community development for over ten years. Currently, as the Executive Director of Inner City Advisors, Jose provides strategic leadership, management and direction to the organization. He is passionate about entrepreneurship, having been raised by his father - a successful farming entrepreneur - who taught him how businesses have the power to transform communities. Jose was recently recognized for his commitment and track record in supporting entrepreneurs by receiving the 2009 Young Professional of the Year Award by the Oakland Metropolitan Chamber of Commerce. Prior to Inner City Advisors, Jose served as Development Director for five years at Mission Economic Development Agency (MEDA), a San Francisco-based nonprofit organization that provides microenterprise business technical assistance and neighborhood planning services to small businesses. Before working in the nonprofit sector, Jose also worked in Corporate Retail Operations and Human Resources at Macy's West, Inc.
Jose sits on various economic development board. He serves on the Oakland Workforce Investment Board and sits on the Bay Area Business Advisory Board of Directors for the Consulate General of Mexico in San Francisco and the OneCalifornia Bank Advisory Board. Jose is also a member of Board of Directors of the YMCA of The East Bay, OBDC Small Business Finance and People's Grocery. He holds a Bachelor of Science degree from UC Davis, and Entrepreneur Management Development Certification from the UCLA Anderson School of Management. When he is not busy doing community development work, you will find him coaching and playing soccer--his other passion. You can read a transcript of this interview on Have Fun Do Good. Interview from July 9, 2009 with David Cohn, the Founder of Spot.us. Spot.Us is a nonprofit project pioneering “community funded reporting.” Through Spot.Us, the public can commission journalists to do investigations on important, and perhaps overlooked stories. David is a journalist turned entrepreneur who has written for Wired, Seed, Columbia Journalism Review and The New York Times. While working toward his master’s degree at Columbia University’s Graduate School of Journalism, Cohn worked as an Editor at newassignment.net, which focused on citizen journalism and ways news organizations could explore the social web. He recently became a contributing editor at NewsTrust.net, a non-profit media literacy tool and news filter, and is the editor-in-chief at Broowaha, an expanding citizen journalism network. You can read a transcript of the interview on my blog, Have Fun * Do Good. Kjerstin Erickson, the founder and Executive Director of FORGE. FORGE is a US-based nonprofit organization that facilitates African refugees’ developing and running projects in their communities that range from libraries to health centers to microlending programs to preschools. Erickson founded FORGE in 2003, when she was a 20 year-old junior studying Public Policy at Stanford University. Now 26, Kjerstin continues to manage FORGE's operations, growth and development. FORGE serves 60,000 refugees in 3 different refugee camps in Southern Africa, and is an official Operating Partner of the United Nations’ refugee agency (UNHCR). She has been named a Haas Public Service Fellow at Stanford, a "Top 10 College Woman" by Glamour Magazine, and a "Person You Should Know" by CNN. Zainab Salbi is the Founder and CEO of Women for Women International, an organization that helps women survivors of war rebuild their lives. She is also the author of two books, Between Two Worlds: Escape from Tyranny: Growing Up in the Shadow of Saddam, and The Other Side of War: Women’s Stories of Survival & Hope. In 1995, President Clinton honored Zainab at a White House ceremony for her humanitarian work. In 2005, Forbes gave her its Trailblazer Award. In 2006, Women for Women International received the Conrad N. Hilton Humanitarian Prize, and in 2007, Zainab was selected as a Young Global Leader by the World Economic Forum. Yoga instructor, Seane Corn, has been featured in commercials and appeared on the cover of Yoga Journal, Fit Yoga, and many other magazines. She utilizes her national platform to bring awareness to the HIV/AIDS crisis, and is the National Yoga Ambassador for YouthAIDS. Seane is also the co-founder of Off the Mat, Into the World an educational, experiential and motivational process for people interested in conscious activism and service. You can learn more about Seane's work at www.seanecorn.com and experience her teaching on her DVDs Vinyasa Flow Yoga and Seane Corn: Yoga From the Heart. Interview from February 11, 2009 with Bryant Terry, eco-chef, food justice activist, and author of Vegan Soul Kitchen: Fresh, Healthy, and Creative African-American Cuisine. Bryant is currently a Fellow in the Food and Society Policy Fellows Program, a national project of the W.K. Kellogg Foundation. His first book, Grub: Ideas for an Urban Organic Kitchen, which he co-authored with Anna Lappé, won a 2007 Nautilus Award for Social Change. He was also a co-host of the PBS series, Endless Feast. You can read a transcript on this interview on my blog, Have Fun Do Good. Favianna Rodriguez is a political digital artist and printmaker based in Oakland, California. She is the co-founder of the EastSide Arts Alliance (ESAA) and Visual Element, programs dedicated to training emerging artists. She is also the co-founder and president of Tumis, a bilingual design studio serving social justice organizations. Utne Reader named Favianna one of their 2008, “50 Visionaries Who Are Changing Your World,” and she recently received a Sisters of Fire Award from the Women of Color Resource Center. For more information about Favianna and her work, go to favianna.com. Marianne Manilov is the National Team Leader of The Engage Network, a nonprofit social venture that promotes widespread civic engagement. At the moment, The Engage Network includes three "sectors": What's Your Tree?, inspired by Julia Butterfly Hill's tree-sit, Off the Mat Into the World, founded by yoga teacher Seane Corn, and Green for All founded by Van Jones. You can find out more about the Engage Network at www.engagenet.org. Photo: The Engage Network Founders: Marianne Manilov, Ina Pockrass and Alissa Hauser. Cami Walker is the founder of the 29 Day Giving Challenge, a global giving movement where participants give away one thing away each day for 29 days. You can read a transcript of this interview on my blog, Have Fun * Do Good. Cami is writing a book about the 29-Day Giving Challenge. She is looking for personal stories about the healing power of giving from people who have completed the Challenge. The deadline to submit your story is November 29, 2008. Martin Fisher is the Co-founder and CEO of KickStart. KickStart is a non-profit organization that develops and markets new technologies in Africa. These low- cost technologies are bought by local entrepreneurs and used to establish highly profitable new small businesses. The organization has received numerous awards for its work including Fast Company’s Social Capitalist Award, Schwab’s Outstanding Social Entrepreneurs for 2003, and TIME Europe's European Hero award. Fisher recently received the $100,000 Lemelson-MIT Award for Sustainability. A big thanks to Houria Iderkou who made it possible for me to interview Martin Fisher. Check out her KickStart Cause on Facebook. A transcript of this interview is will be available on my blog, Have Fun * Do Good. Ari Derfel talks about what he learned after saving his trash for one year. You can read more about his experiment on his blog, Save Your Trash at http://saveyourtrash.typepad.com. Ari is the co-founder of Back to Earth Catering and Outdoor Adventures. Long time Big Vision Podcast listeners may have heard an interview with Ari and his co-founder, Eric Fenster, in 2006. Janessa Goldbeck is the Director of Membership at the Genocide Intervention Network, a nonprofit organization that provides individuals and communities with the tools to prevent and stop genocide. As a college student, Janessa served as the first National Outreach Coordinator for STAND, helping to build what started as a group of students at a few schools nationwide into an international clearinghouse organization for student anti-genocide activism. In just two years, Janessa served a pivotal role in expanding STAND to more than 850 schools worldwide and merging the organization with the Genocide Intervention Network. Since graduation, she has produced several short films on the student anti-genocide movement, and appeared at numerous conferences, forums and trainings on behalf of STAND and the Genocide Intervention Network. Her work now focuses on building a constituency of conscience among all age groups. Janessa is a graduate of Northwestern University and holds a degree in Magazine Journalism and a certificate in African Studies, as well as a certificate in Sustainable Development from the School for International Training in Uganda. You can read a transcript of this interview on my blog Have Fun * Do Good. This month's interview is with Kavita Ramdas, the President and CEO of the Global Fund for Women. The Global Fund for Women is an international network of women and men committed to a world of equality and social justice. They advocate for and defend women's human rights by making grants to support women's groups around the world. Ramdas has been the recipient of many awards including Fast Company's 2007 Social Capitalist Award, and the League of Women Voters’ Women Who Could Be President Award. Cristi Hegranes is the Founder of The Press Institute for Women in the Developing World. "The Press Institute for Women in the Developing World is an international nonprofit organization and citizen journalism initiative. The Institute was founded on the belief that journalism is an empowering tool that can bring voice, strength and light to issues that are hidden and people who are oppressed." Women's eNews named her one of the 21 Leaders of the 21st Century for 2008, and she was also awarded the annual Ida B. Wells prize for Bravery in Journalism. Christina Arnold is the Founder of Prevent Human Trafficking. Prevent Human Trafficking is a Washington DC-based nonprofit working to build a bridge between South East Asia and the United States to prevent human trafficking. Prevent Human Trafficking empowers individuals, organizations and governments to tackle the root causes of human trafficking through direct support and technical assistance. The Rockwood Leadership Program specializes in delivering the best practices and methodologies in leadership development to the non-profit community. Andre Carothers is the Rockwood Leadership Program's Executive Director and Co-founder. Since 2000, Rockwood has trained more than 1500 leaders from thousands of organizations in the US and Canada through a variety of programs designed to increase the collaborative capacity of the non-profit advocacy sector. Andre served on the staff and Board of Directors of Greenpeace USA, and currently serves on the boards of the International Rivers Network and the Rainforest Action Network. Shalini Kantayya is a filmmaker, educator, and activist who uses film/video as a tool to educate, inspire, and empower audiences. Shalini believes in making films that spark positive social change. The mission of her production company, 7th Empire Media, is to bring a professional voice to the unheard through media. Shalini finished in the top 10 out of 12,000 filmmakers on FOX’s ON THE LOT, a reality show by Steven Spielberg and Mark Burnett, in search of Hollywood’s next great director. You can see a trailer from her film, A Drop of Life, at www.adropoflife.tv. You can read a transcript of this interview on Have Fun * Do Good. Marsha Wallace is the founder of Dining for Women. Dining for Women's mission is to empower women and children living in extreme poverty by funding programs that foster good health, education, and economic self-sufficiency and to cultivate educational giving circles inspiring individuals to make a difference through the power of collective giving. Elizabeth Pomada is a literary agent who co-founded the Writing for Change Conference and the San Francisco Writers Conference with her husband, Michael Larsen. Together, they started Michael Larsen - Elizabeth Pomada Literary Agents in 1972. She talks about the Writing for Change Conference and tips for writers who want to write for change. Chris Messina of Citizen Agency and Ivan Storck of SustainableMarketing.com and SustainableWebsites.com talk about how to start a green coworking space based on their experience with Citizen Space in San Francisco, CA. In this episode, rather than hearing an interview with one individual, I wanted to share a recording from a panel I organized for the Stanford Women's Leadership Conference in April called, Solutionary Women: How Can I Create Social Change? I asked four of the women who I had previously interviewed for the Big Vision Podcast to share what brought them to their work, and their advice to the graduate and undergraduate women who attended the conference. You'll hear from Alli Chagi-Starr who is the Co-Founder of Art in Action, and the Art and Media Director of Reclaim the Future for the Ella Baker Center for Human Rights, Ilyse Hogue, the Campaign Director of MoveOn.org, Melinda Kramer, the Founder and Director of Women's Earth Alliance, and Reem Rahim, the Co-Founder and Vice President of Marketing for Numi Tea. You can read a transcript of this panel on my blog, Have Fun * Do Good. Van Jones is working to combine solutions to America's two biggest problems: social inequality and environmental destruction. In 1996, Van founded the Ella Baker Center for Human Rights. Named for an unsung civil rights heroine, the Center promotes alternatives to violence and incarceration. As an advocate for the toughest urban constituencies and causes, Van has won many honors. These include the 1998 Reebok International Human Rights Award, the international Ashoka Fellowship, selection as a World Economic Forum "Young Global Leader," and the Rockefeller Foundation "Next Generation Leadership" Fellowship. Van is also a national environmental leader, having served on the boards of the National Apollo Alliance, Social Ventures Network, Rainforest Action Network, Bioneers and Julia Butterfly Hill's Circle of Life organization. Van's dual roles have given him a unique perspective on the country's problems and its potential solutions. He is calling for green economic development for urban America. The City of Oakland has adopted the Ella Baker Center's "Green Jobs Corps" proposal, which will train youth for eco-friendly "green-collar jobs." Now Van is pushing to create the first-ever Green Enterprise Zone, to attract environmentally-sound industry to Oakland. A 1993 Yale Law graduate, he is also a husband and father. A rising star, Van champions the most hopeful solutions to America's toughest challenges. Paul Rice is the founding President & CEO of TransFair USA, the only Fair Trade certification organization in the U.S. today. Since launching the Fair Trade Certified label eight years ago, TransFair has established Fair Trade as the fastest growing segment of the $19 billion coffee industry. TransFair is rapidly expanding Fair Trade certification into tea, chocolate, rice, sugar, bananas and other fresh fruits. Previously, Paul worked for 11 years as a rural development specialist in the Segovias region of Nicaragua, where he founded and led an organic coffee export cooperative called PRODECOOP. In 2000 he received the international Ashoka Fellowship for his pioneering work as a social entrepreneur in the Fair Trade movement. Paul was also honored by the Klaus Schwab Foundation for Social Entrepreneurship as one of the world's top 40 Social Entrepreneurs in 2002. More recently, Paul spoke on Fair Trade at the World Economic Forum in Davos, Switzerland, in January 2004 and 2005. Priya Haji built the concept for World of Good while completing her MBA at UC Berkeley. She has led the company from inception to its current stage with a focus on using the engine of enterprise to create social impact. She also serves as the Board Chair for the World of Good: Development Organization, the 501(c)3 non-profit sister organization of World of Good, Inc.
She was recognized in 1998 as one of America's 10 Most Outstanding Young Leaders (Brick Award) by the Do Something Foundation, MTV and Mademoiselle Magazine. Reem Rahim is the Co-founder and Vice President of Marketing of the Oakland-based green business Numi Tea. She is also the creator of the beautiful cover art on the tea's boxes. In the Fall of 1999, brother and sister Ahmed and Reem had a vision to revive the "serenity, creativity, and comfort that is inspired by the simple art of tea." Now they are the #9 brand in the natural food industry out of about 225 tea companies. Reem talks about how the company balances the triple bottom line of profits, people and planet. A transcript of this interview is available on my blog Have Fun * Do Good. Kevin Danaher is the co-founder of the nonprofit, Global Exchange. In addition to its Reality Tours and Fair Trade stores, Global Exchange co-sponsors the Green Festivals with Co-op America. Kevin talks about The Global Citizen Center. The Center will be a large, mixed-use building in downtown San Francisco that will serve as a hub for ecologically and socially responsible enterprise, education, and economic development. Melinda Kramer is the co-founder of Women's Global Green Action Network(WGGAN). WGGAN cultivates global partnerships of grassroots women environmental leaders by providing access to communication tools, support services and networking capabilities. Working with organizations like Pacific Environment, the PIRGs, the Sierra Club, CARE Kenya, and the St. Louis Lead Prevention Coalition, Melinda has been involved in multi-stakeholderwork, coalition-building, campaign-organizing, legal assistance and capacity building. Ingrid Severson is the Lead Organizer of the Rooftop Resources Project, a project of Bay Localize. The Rooftop Resources project is researching the applicability and benefits of green roofs, rainwater catchment and solar power in in the Bay Area. Ingrid gained experience in the environmental field at San Francisco State University, New College of California, and an intensive permaculture design course. She has worked with Sonoma County Conservation Action, the Sierra Club Bay Chapter, and a video production group that promotes environmental awareness and education. A transcript of the interview is available on my blog, Have Fun * Do Good. Jessica Jackley Flannery is the co-founder and a board member of Kiva, a nonprofit that is using the Internet to connect people through loans to alleviate global poverty. Jessica has worked in rural Kenya, Tanzania, and Uganda with the Village Enterprise Fund and Project Baobab on impact evaluation and program development. Earlier, Jessica spent three years in the Stanford Business School's Center for Social Innovation and Public Management Program, where she helped launch the inaugural Global Philanthropy Forum. Jessica is currently pursuing an MBA at the Stanford Graduate School of Business. A transcript of the interview is available on my blog Have Fun * Do Good. You can watch a documentary about Kiva on FRONTLINE World on Tuesday, October 31,2006, or on the FRONTLINE World web site via streaming video a few days after the broadcast. You can view a brief preview of the October 31st show on Google video. Full disclosure: I'm friends with the Editor for FRONTLINE World, David Ritsher. If you've been listening to the last seven shows, they were all recorded between February and June 2006 and originally hosted on Gcast. Now I'm done with the transfer of old interviews and we're on to the new! I'm thrilled to have had an opportunity to interview Anna Lappe, the co-author of Grub: Ideas for an Urban Organic Kitchen with Bryant Terry, and co-author of Hope's Edge with her mother Frances Moore Lappe. Anna is also a co-founder, with her mother, of the Small Planet Fund, and a founding principal of the Small Planet Institute, based in Cambridge Massachusetts. You can read a transcript of this podcast on my blog, Have Fun * Do Good. When I interviewed Ilyse Hogue back in June, she was still the Global Finance Campaign Director for the Rainforest Action Network, but now she is the Campaigns Director for MoveOn.org. Abby Rosenheck (actually, she is Abby Jaramillo now) is the founder and Executive Director of Urban Sprouts, a school gardening program in San Francisco. Mei-ying Ho is the co-Director of SOUL (The School of Unity and Liberation) a youth activist training program. You can read a transcript of this interview at my blog, Have Fun * Do Good. 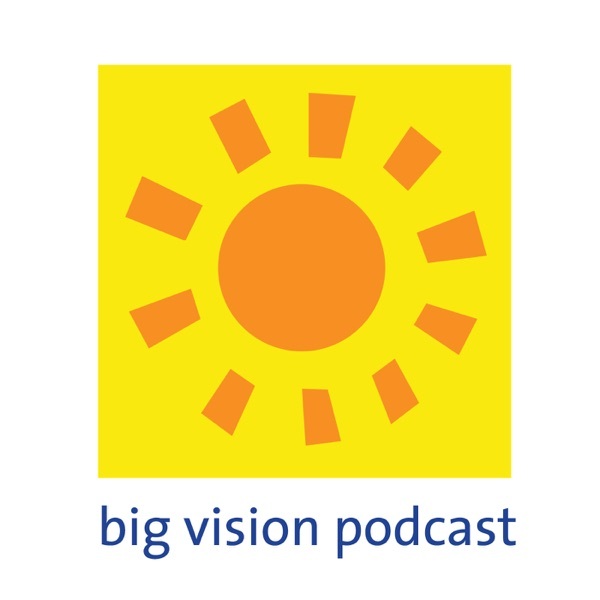 Welcome Big Vision Podcast listeners new and old. I am transferring my interviews over from Gcast, where I started posting the Big Vision podcast in February of 2006. My first interview was with Alli Chagi-Starr. Alli is the Art and Media Director of the Ella Baker Center for Human Rights' Reclaim the Future Program. Alli is also the co-founder of Art and Revolution, and founder of Art in Action, Dancers without Borders, and the Radical Performance Fest. In addition to being an artist, performer and dancer, Alli is also a writer, whose most recent piece can be found in the Code Pink anthology, Stop the Next War Now.